11 Feb. 2019: At Sea. 11 Feb. 2018: At Sea. Yesterday I boarded the ms Zuiderdam in Willemstad after having been on vacation since December 18 after leaving the ms Nieuw Statendam when it ended its maiden voyage in Ft. Lauderdale. During my vacation time, the IT gurus of Holland America have been moving my blog to a separate server for operational reasons. It should not have affected anybody as I am still linked through via the HAL blog but you can also reach me via www.captainalbert.com. Never a dull moment when you work for Holland America. I will be on board the ms Zuiderdam for three weeks to help with preparing for an upcoming audit and to spend some time with new officers, to teach them a few tricks of the trade. ms Zuiderdam making 10 and 11 day cruises to the South West Caraibbean and Mexico and Costa Rica. 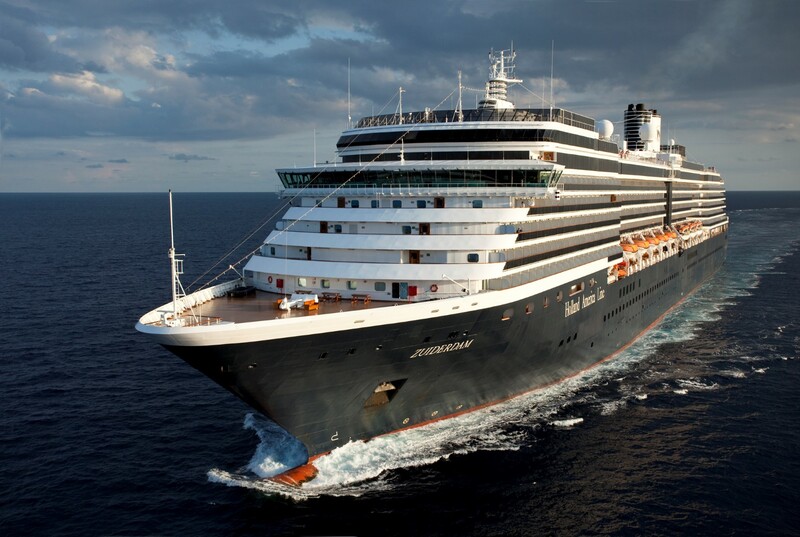 The ms Zuiderdam is making 10 and 11 day “sunfarer” cruises to the South West Caribbean and Middle America. (This is Panama and Costa Rica, as they are officially not part of the Caribbean. At least that is what geographers tell me) so I jumped onto the ship in the middle of the cruise by coming on board yesterday in Willemstad. Main reason for that is, is that KLM has a direct flight from Amsterdam to Willemstad and that omits the need to fly via the USA. Which would not only be a longer journey but also would have meant going through American immigration. This normally means waiting in line for an hour. American airports have not progressed yet to having the option that you can travel through while staying in the international zone. I believe that Minneapolis was going to experiment with this but if it ever started, I do not know. So all flights from anywhere that go to and Hub airport in the USA result in seeing CBP regardless if the USA is your final destination. And if CBP is busy with too many flights coming in at the same time, you can miss your connecting flight. Thus KLM non-stop to Willemstad was in this case a much better option. By 1900 local time I was sitting on my balcony watching the Caribbean sun setting in the sea and all was well in the world. The good ship Zuiderdam is under the command of Captain Bart Vaartjes (see bio on the blog) who also happens to celebrate his birthday today. And he is doing that by rocking the boat as we are expecting some turbulent seas this evening. What is going on is, that the normal Trade Wind is a lot stronger than usual. We are on the way from Willemstad to Cartagena and for that we have to sail north of Colombia. That is the South West end of the Caribbean Sea and when looking from here to the North East it is one open sea surface all the way to St. Thomas. Thus the Trade winds can freely push up the waves to a maximum. Every ship which sails on a SW course towards Panama or veers south to Cartagena will get this wind and swell in the stern. And this under a ¾ angle of the stern. That creates a corkscrew motion with the ship, which is very hard for the ships stabilizers to deal with. As it is not rolling (= where we have stabilizers for) and it is not pitching (bow / stern go up and down for which we can slow down or speed up) thus the ship will move whatever the captain tries. The swell/surf diagram for tonight. Green is to 12 feet, yellow goes over 12 – 15 feet. So not too bad as there is no red in the picture but the waves are still high enough to make it wobbly. Now the last few days a cold front has been coming in which has enhanced this trade wind considerably and has pushed the waves up from about a normal 10 feet to 15 feet. Any wave height of over 11 to 12 feet makes a ship move. Now we get 15 feet and add to that the normal corkscrew motion and the ship “rocks”. Thus we will not have particularly bad weather tonight but the moving ship really makes it feel as if it is. The captain warned all the guests and crew, and advised to stow everything safely in the cabins, to be careful walking around this evening; and hold on tightly to their glass of wine while sitting in the bar. You do not want to spill it, even if it is the 2nd glass during happy hour. The motion will last until we turn south towards Boca Chica, the estuary entrance to Cartagena. There we will be around 05.30 and then race into the port for a docking before 07.00 hrs. There are supposed to be two more cruise ships in port so it will be a busy day. The weather is supposed to be nice tomorrow. Warm with a gentle breeze, as the strong ocean winds normally do not reach the sheltered port of Cartagena all the way inside. 18 December 2018; Crossing the North Atlantic, Day 8 and Final Day. 12 Feb. 2019; Cartagena, Colombia. Zuiderdam in July 2018, it is now our favorite HAL ship. One thing I’d like to see is taking a question or two once a week from your followers. Great to have you back, Hope your rest period went well. Nice to see you back Captain. Did have a bus and holiday will you were gone? I am delighted to see your blog again Captain Albert, (hardstikke leuk!) I hope you had a restful time on leave.I read your blog about the crossing of the Atlantic on the Nieuw Statendam with interest as I have a friend (with HAL) who just moved over from the Eurodam to work on board the ship for it’s maiden voyage. (By the way,I loved Captain de Boer’s speech, it touched my heart.) I am sure the Zuiderdam will be in capable hands of Captain Vaartjes. Tell him he is not the only one dealing with unusual storms ,the Eurodam is dealing with high seas around the Hawaiian Islands. She better not sustain damage as we hope to sail on her in April !! Have a rewarding and, eventually, a smooth journey. Kind regards. It’s good to have you back with your interesting comments, and thank you. We’re taking the Zuiderdam across the North Atlantic from Rotterdam to Boston in July. It was your comments about this trip when you did it on the Rotterdam that got us interested! Welcome back. It’s great to read your blog again. Looking forward to reading your blog again. Just finished an 11- day Sunfarer on the Zuiderdam. Wonderful trip. Thank you, Captain Albert, for your informative and fun blog. The worst wind we have experienced on a ship was after leaving Cartagena heading for Ft. Lauderdale. Not even crew were allowed outside. Hi Capt ! My wife and I have been enjoying your blog since we served together with you on Prinsendam. Thank you for consistantly posting. Cheers ! Welcome back! Wish Capt Bart happy birthday for us. Sailed with him on Viking Passage in August. Quite the adventure! Welcome back captain Albert. It ‘s a pleasure to read your blog! I love reading about your adventures at sea! Your blog is making my “cruise withdrawal syndrome” act up~!! Last’s year’s Voyage of the Vikings and a 14 day Caribbean cruise have worn off. We have got to get on a ship and that Grand Pacific is looking real attractive~!! No other cure will work. Thanks for the blog – it’s second best to being there ourselves~!! Thank you so much captain Albert, glad your’re back. I learn a lot reading this blog and enjoyed your stories so much on the beautiful ss Rotterdam as a shiphost, learning every day more and more. Good to read you are back captain Albert. Have a pleasant stay on the Zuiderdam. Regards from Holland. We are sailing on Zuiderdam Feb 27. Hope to have a chance to say hello. Enjoy your blogs. Glad to know that Capt Bart is on board. He piloted us safely through a hurricane a few years ago. It was our first large ship cruise and we’ve been exploring the world on HAL since. Great your back. Looking forward to a new series of blogs. Hope to see you in the Maasdam in June.